Investing in a tree adds shade to your yard, value to your home and is a gift to your city. The Cool Urban Space Project by the City of Phoenix, University of Arizona and Arizona State University showed that a goal of 25 percent canopy could reduce near-ground temperatures in the city by 4.3 degrees. Trees also reduce air pollution, storm runoff and residential energy costs. Despite their value, people do not plant many trees as part of their desert landscapes. Trees are an investment that some people fear may be difficult to maintain. They see trees in their neighborhood that look thin and hacked, awkward and vulnerable. Scottsdale’s Conservation Specialist Bill Casenhiser is responsible for the beautiful trees in the Scottsdale Xeriscape Garden. One of his secrets is proper pruning. Here are 10 tips for keeping your drought-tolerant tree healthy and lovely for many years, whether you prune them yourself or have a landscaper trim them for you. 1. Do not prune a young tree to look like a mature tree. Shape a young tree for about four years. Take the pruning slowly, gradually pruning it a little bit at a time over 4 years to get it to look the way you want. Remove weak branches that are dangling and any branch rubbing or crossing another. 2. Temporarily leave lower branches on a young tree. Those little branches are feeding lower sections of the tree through photosynthesis. These branches are what give a mature tree heft on the bottom that tapers towards the top. 3. Only prune a mature tree when you must. Look for dead or diseased branches that need to be cut out and branches that are rubbing or crossing. This is called a “crown cleaning" or thinning. Sometimes you need to cut a branch that’s rubbing against the house. Once that limb is removed, you may need to remove a few others to give the tree a balanced canopy. 4. If an old tree is in poor health, less pruning may help. Trim only dead branches. Healing after a pruning weakens a tree and reduces photosynthetic capability. You only need to sustain old trees with fertilizer and water. 5. Don’t prune because you’ve just bought a new saw. Recreational pruning is discouraged. Determine why you want to trim a tree. Is the objective safety, health or beauty? Have a reason. Less trimming gives you a healthier, lovelier tree. 6. Don’t “thin” a tree by removing all the greenery in the middle and leaving foliage only on the outer ends of branches. This mistake is called “lion tailing.” During a high wind these branches will bend at a weak spot in the middle of the branch and be more likely to snap off. 7. If a tree stands between you and a view, don’t chop off the top of the tree until you can see the mountains or city skyline. Thin the tree so you can see the view through the tree. This is called a “vista prune.” Make “reduction cuts” by removing taller thicker branches back to a lower branch that is at least a third of the size of the branch being removed. Never “top off” a tree. 8. If a tree branch is hanging over the driveway, do not cut the branch a foot back from the edge of the driveway. Cut the offending branch back to where it is attached to the tree. Every cut made to a tree needs to be made at the intersection of where two branches join. When a branch is cut the right way it signals the tree to generate chemicals and growth that close the wound. This does not happen when you cut randomly anywhere along the branch. 9. Do not remove more than 25 percent of the foliage of a tree within a year. Some people want to remove half a tree’s growth at one trimming to make the effort “worthwhile.” It’s not necessary and what grows back will be unhealthy, weak, weepy, and dangly. You force dormant buds to grow and increase suckers. Then you start a cycle of heavy trim and weak growth and can create an ugly tree vulnerable to disease. 10. Plant the right tree in the right place. Know what you are planting. Some trees, such as a Willow Acacia, grow 20 feet tall and 15 feet wide. Some people try but this willowy tree cannot be pruned to produce a round wide canopy. A Palo Verde will grow 25 feet tall with a 25 foot round canopy and can’t be pruned to be a tall, oval. You should have chosen the Willow Acacia. AMWUA's Landscape Plants for the Arizona Desert can help you select the right tree for the right space before you go to the nursery. Cities are offering plenty of free landscape classes right now on a variety of topics. For example, as part of Scottsdale’s classes Bill is offering an instructive tour through the Scottsdale Xeriscape Garden April 21. The City of Glendale is offering The Giving Tree: Desert Tree Care on April 8. Glendale also has a Tree Trail as part of its demonstration garden and the city’s Water Conservation website has a video series about desert tree care. It may be worth your while to find out what landscape classes your city is offering. Cities’ Water Conservation websites also offer landscaping tip sheets, pamphlets, guidebooks and videos. 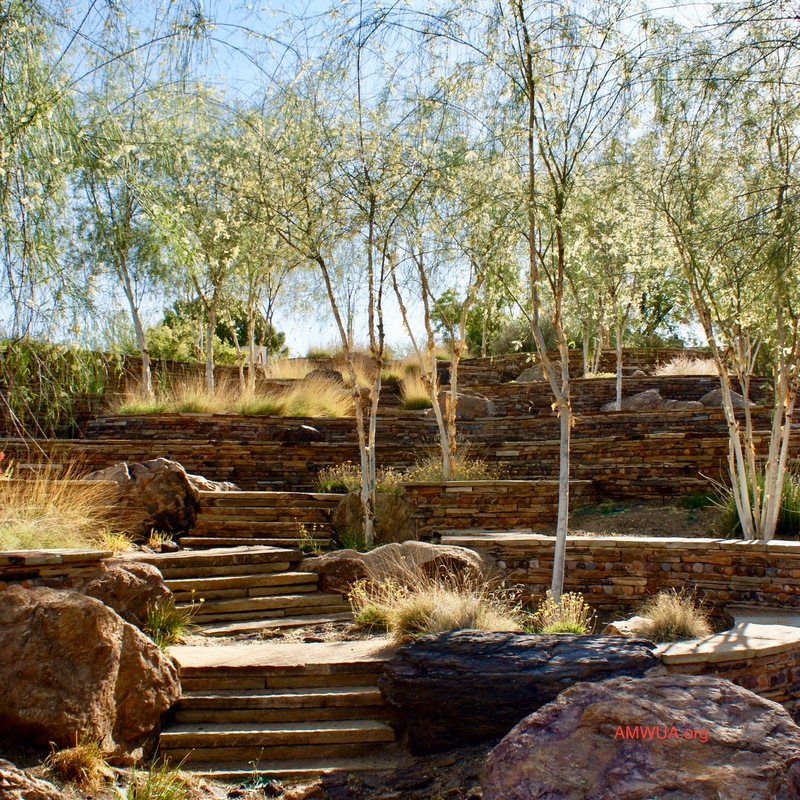 Photo: Palo Blanco trees in the Scottsdale Xeriscape Garden.